2-Thomas William Harris was born on 4 May 1818 in Kent, was christened on 31 May 1818 in Saint Paul, Deptford, Kent, England, died in 1904 in Victoria, Australia at age 86, and was buried in Eastern Cemetery. Thomas married Caroline Sadler, daughter of James Sadler and Elizabeth Maton, on 26 Feb 1849 in St Johns Church New Town. Caroline was born on 15 Aug 1826 in St Matthew, Middlesex, England and died in 1918 in Geelong, Victoria at age 92. They had 11 children: Thomas Sadler, Charles James, Edward, Ann Caroline, Elizabeth Sadler, Frank, Henry James, Jane Charlotte, Samuel Archer, Mary Ella and Alice Esther. 3-Thomas Sadler Harris was born on 17 Jan 1850 in Hobart and died on 16 Feb 1886 in his residence, Elizabeth Street, Geelong at age 36. Thomas married Maria Eliza Hunt, daughter of Thomas Barber Hunt and Sarah Yates, in 1876 in Victoria. Maria was born in 1853, was christened in Geelong Wesleyan, and died in 1917 at age 64. Another name for Maria was Maria Eliza Harris. They had four children: May Caroline, Ernest Norman, Daisy Laura and Constance Ruby. 4-May Caroline Harris was born in 1877 in Geelong, Victoria and died in 1949 in West Geelong, Victoria at age 72. 4-Ernest Norman Harris was born in 1879 in Geelong, Victoria. 4-Daisy Laura Harris was born in 1882 in Geelong, Victoria and died in 1928 in Geelong, Victoria at age 46. 4-Constance Ruby Harris was born in 1885 in Geelong, Victoria and died in 1939 in Geelong, Victoria at age 54. 3-Charles James Harris was born on 9 Jul 1851 in Hobart. Charles married Isabella Wilkinson in 1887 in Victoria. They had no children. 3-Edward Harris was born in 1854 in Newtown, Geelong, Victoria and died in 1929 in Camberwell, Victoria at age 75. Edward married Ruth Clifton Pearson, daughter of Frederick Thomas Birks Pearson and Rebecca Kelvey, on 20 Jan 1880 in Geelong, Victoria. Ruth was born on 13 Dec 1857 in McKillop Street, Geelong, Victoria and died on 20 Apr 1944 in Camberwell, Victoria at age 86. They had six children: Elsie Ruth, Ivy Louischen Constance, Marion Beatrice, Annie Stella Isabel, Edward Chapman and Ethel May. 4-Elsie Ruth Harris was born in 1883 in Portland, Victoria and died in 1978 in Macleod, Victoria at age 95. Elsie married Arthur Henry Potter, son of William Henry Potter and Mary Markham, in 1910 in Victoria. Arthur died in 1957. They had no children. 4-Ivy Louischen Constance Harris was born in 1885 in Fitzroy, Victoria and died on 6 Jun 1966 in Canterbury, Victoria at age 81. 4-Marion Beatrice Harris was born in 1886 in Fitzroy, Victoria and died in 1938 in Camberwell, Victoria at age 52. 4-Annie Stella Isabel Harris was born in 1888 in Clifton Hill, Victoria and died in 1969 in Eltham, Victoria at age 81. Annie married James Agnew Stafford, son of George Stafford and Eliza Agnew, in 1912 in Victoria. 4-Edward Chapman Harris was born on 9 May 1890 in Clifton Hill, Victoria and died in 1995 in Macleod, Victoria at age 105. Edward married Alison Brock, daughter of Alexander Brock and Hannah Carnochan, in 1917 in Victoria. Alison was born in 1885 in Parkville, Victoria and died on 20 Apr 1973 in Melbourne, Victoria at age 88. They had three children: Lynette Brock, Edward Milton and Ruth Alison. 5-Lynette Brock Harris was born on 3 Apr 1918 in Kyneton, Victoria and died on 21 Jun 1981 in Fairfield, Victoria at age 63. 5-Edward Milton Harris was born on 22 Nov 1921 and died on 20 Sep 2011 at age 89. 5-Ruth Alison Harris was born on 9 Mar 1925 in Adelaide, South Australia and died on 26 May 2010 in Point Lonsdale, Victoria at age 85. Ruth married James Angus Dredge, son of Theo Harvey Melvin Dredge and Sarah Watt. James was born on 3 Feb 1920 in Thornbury, Victoria and died on 31 Oct 2009 in Geelong, Victoria at age 89. 4-Ethel May Harris was born in 1892 in Clifton Hill, Victoria and died on 13 Dec 1981 in Victoria at age 89. Ethel married Charles Robert Woff, son of George William Woff and Martha May Lepage, in 1923 in Victoria. Charles was born in 1900 in Cheltenham, Victoria and died in 1983 in Melbourne, Victoria at age 83. 3-Ann Caroline Harris was born in 1856 in Newtown, Geelong, Victoria and died in 1933 in Balwyn, Victoria at age 77. 3-Elizabeth Sadler Harris was born in 1858 in Newtown, Geelong, Victoria and died in 1929 in Surrey Hills, Victoria at age 71. Elizabeth married Joshua Robert Whalley, son of John Whalley and Hannah Calvert, in 1898 in Victoria. Joshua was born in 1864 and died in 1939 in Balwyn, Victoria at age 75. They had no children. 3-Frank Harris was born in 1859 in Newtown, Geelong, Victoria and died in 1946 in Daylesford, Victoria at age 87. Frank married Annie Mary Kirkwood, daughter of Alfred Evan Kirkwood and Annie Taylor, in 1883 in Victoria. Annie died in 1943. They had no children. 3-Henry James Harris was born in 1862 in Newtown, Geelong, Victoria and died in 1866 in Newtown, Geelong, Victoria at age 4. 3-Jane Charlotte Harris was born in 1864 in Newtown, Geelong, Victoria and died in 1947 in Balwyn, Victoria at age 83. 3-Samuel Archer Harris was born on 2 Mar 1866 in Geelong, Victoria and died in 1948 in Ringwood, Victoria at age 82. Samuel married Anne Elizabeth Butler, daughter of Richard Butler and Elizabeth Jebb, on 12 Sep 1895 in Ascot Vale, Victoria. Anne was born on 12 Dec 1861 in Cavan, Ireland and died on 1 Jun 1931 in Camperdown, Victoria at age 69. They had one son: Howard Archer. 4-Howard Archer Harris was born on 3 Jul 1900 in Lincoln, Canterbury, New Zealand and died in 1982 in Ringwood, Victoria at age 82. Howard married Elsie Wigley on 6 Nov 1926 in Ringwood, Victoria. Elsie was born on 26 Mar 1903 in Sheffield, England. 3-Mary Ella Harris was born in 1868 in Geelong, Victoria and died in 1951 in West Geelong, Victoria at age 83. Mary married Edward Caleb Mountjoy, son of Caleb Mountjoy and Louisa Jane Harward, in 1895 in Victoria. Edward was born in 1870 in Ceres, Victoria and died in 1963 in Geelong, Victoria at age 93. They had one son: Lawrence Harward. 4-Lawrence Harward Mountjoy was born in 1897 in Geelong, Victoria. 3-Alice Esther Harris was born in 1871 in Geelong, Victoria and died in 1932 in Balwyn, Victoria at age 61. 2-William Benjamin Harris was born on 8 Apr 1821 in Deptford, Kent, England, was christened on 29 Apr 1821 in Saint Paul, Deptford, Kent, England, died on 22 Feb 1904 at his residence, 49 Weller St, Geelong West, Victoria at age 82, and was buried in Geelong Western Public Cemetery. William had a total of four wives and fifteen children, of whom five died while young, across two states. William first married Eliza Macbeth, daughter of Peter Macbeth and Mary Ann Presland, on 29 Apr 1848 in Hobart, Tasmania. Eliza was born on 12 Apr 1821 in London, England, died in Feb 1863 in Victoria at age 41, and was buried on 27 Feb 1863 in Geelong Western Cemetery. In 1849, when first child William Louis was born he was living in Harrington Street, Hobart but by 1850 he was a Swansea storekeeper. William and Eliza were storekeepers and postmaster in Shaw’s Building in Franklin Street built for and owned by Edward Shaw. This pre-dates the better known Morris’ store which is opposite. In early 1853 ex-convict John Webster took over the lease and bought William’s stock. Their departure to Geelong, Victoria may have been prompted by the recent deaths of three of their five children to scarlet fever. 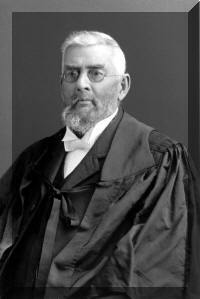 William was the Town Clerk in Geelong for many years, being first appointed in 1879. William and Eliza had ten children: William Louis, Charles Arthur, Eliza, Marion Ellen, Roberta, Martha Edith, Lillias Mary, Rosa Eliza, Florence Burns and Emily Louise. 3-William Louis Harris was born on 29 Sep 1849 in Hobart, Tasmania and died between 1881 and 1904. 3-Charles Arthur Harris was born about Jan 1850 in Tasmania and died of scarlet fever on 10 May 1853 in Great Swanport, Tasmania aged about 3. 3-Eliza Harris was born on 15 Nov 1850 in Spring Bay. 3-Marion Ellen Harris was born on 19 Dec 1851 in Great Swanport, Tasmania and died of scarlet fever on 19 May 1853 in Great Swanport, Tasmania at age 1. 3-Roberta Harris was born on 5 Dec 1852, was christened on 5 Dec 1852 in All Saints Anglican, Swansea, Tasmania, and died on 6 Dec 1852 in Swansea, Tasmania. 3-Martha Edith Harris was born on 13 Sep 1854 in Geelong, Victoria and died on 26 Dec 1928 in Dysart, Tasmania at age 74. Martha married William Merry on 1 Jan 1885 in her father’s home, Weller Street, Geelong, Victoria. In 1903 he was a carpenter, living with Martha in Moonee Ponds. Martha next married Robert John Nichols, son of John Nichols and Ann Fortnam, on 13 Apr 1904 in Moonee Ponds. 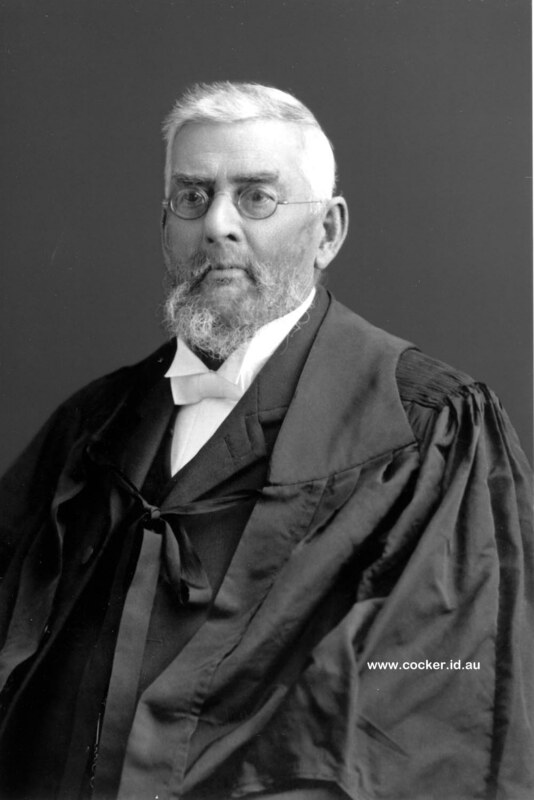 Robert was born on 7 Apr 1843 and died on 15 Dec 1928 in Dysart, Tasmania at age 85. 3-Lillias Mary Harris was born in 1856 in Victoria and died in Dec 1881 in Geelong, Victoria at age 25. 3-Rosa Eliza Harris was born about Apr 1857 in Geelong, Victoria, died in 1858 in Newtown, Geelong, Victoria aged about 1, and was buried on 12 Jan 1858. 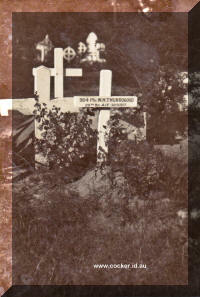 Rosa was the first person buried at Geelong Western Public Cemetery. 3-Florence Burns Harris was born in 1859 in Victoria and died on 30 Dec 1929 in Northcote, Victoria at age 70. HARRIS.—On the 30th December, 1929, at private hospital, Miss Florence Burns Harris, loving sister of Emily (Mrs. Thurrowgood, Bendigo), Ruth (Mrs. McCure, deceased), and Edith (Mrs. Nichols, deceased), aged 72 years, late of Moonee Ponds and Clifton Hill. HARRIS.—The Friends of the late Miss FLORENCE BURNS HARRIS are respectfully informed that her remains will be interred in the Fawkner Cemetery. Her remains will leave the funeral parlours of Joseph Allison, 680 Mount Alexander road, Moonee Ponds, Tomorrow (Thursday, January 2), at 4p.m., arriving at cemetery at 4.25 p.m.
JOSEPH ALLISON, Funeral Director, 680 Mount Alexander road, Moonee Ponds. 3-Emily Louise Harris was born on 22 Apr 1861 in Newtown, Geelong, Victoria and died on 9 Jan 1949 in Bendigo, Victoria at age 87. Emily married FrederickWilliam Thurrowgood, son of George Thurrowgood and Emily Maria Chappell, on 24 Feb 1886 in Duneed, Victoria, Australia. Frederick was born on 4 Oct 1860 in Duneed, Victoria, Australia and died on 13 Mar 1938 in Bendigo, Victoria at age 77. They had nine children: Florence Ada, Laura Edith, Freda Emily, Will Harris, Lillias Macbeth, Raymond Lewis, Gwendoline Louise, Dulcie Miriam and George Harold. 4-Florence Ada Thurrowgood was born on 21 Jul 1887 in Geelong, Victoria and died on 29 Apr 1964 in Hobart at age 76. 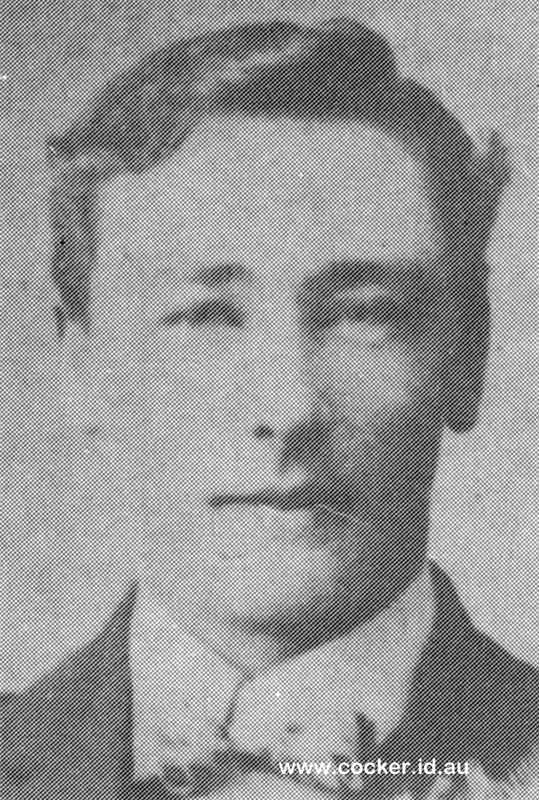 Florence married John Willie Cairns, son of William Cairns and Amelia Emily Nichols. John was born about 1884 in Elmore, Victoria. He served in the First World War. 4-Laura Edith Thurrowgood was born on 12 Aug 1888 in Birregurra, Victoria and died on 1 Jul 1966 in Camberwell, Victoria at age 77. Laura married George Thomas Axford. 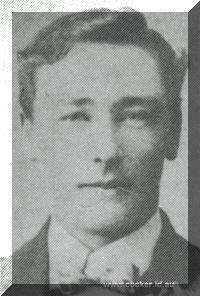 George was born on 8 Aug 1876 in Box Hill, Victoria and died on 3 Aug 1950 in Lilydale, Victoria at age 73. They had nine children: William Douglas, Edith Laura, Frederick George, Florence, Beryl Elizabeth, Alma, Emily, Arthur John and Robert. 5-William Douglas Axford was born on 18 Apr 1909 in Lilydale, Victoria. William married Ruby Stanley in Koowerup, Victoria. They had four children: Douglas, Alan, Brian and Gillian. 5-Edith Laura Axford was born on 13 Sep 1910 in Lilydale, Victoria. Edith married George Gordon King on 16 Apr 1938 in Kew, Victoria. George was born on 27 Jan 1895 in Carlton, Victoria. They had four children: Lawrence Gordon, Graham Douglas, Geoffrey Richard and Lindsay William. 6-Lawrence Gordon King was born on 7 Nov 1940 in Auburn, Victoria. Lawrence married Ann Spencer jarvis Burns in Melbourne, Victoria. 6-Graham Douglas King was born on 25 Mar 1944 in Camberwell, Victoria. Graham married Elspeth Snell Vagg on 15 Dec 1981 in Canberra, Australian Capital Territory. 6-Geoffrey Richard King was born on 18 Nov 1946 in Surrey Hills, Victoria. Geoffrey married Jennifer Kaye Blake on 19 Mar 1977 in Vermont, Victoria. Jennifer was born on 5 Dec 1949. They had two children: Warren Russell and Andrew Russell. 6-Lindsay William King was born on 5 Aug 1950 in Coburg, Victoria. Lindsay married Patricia Francis Russell on 25 May 1974 in Gumnadai, New South Wales. Patricia was born on 30 Mar 1952. They had two children: Karen Frances and Christopher Lindsay. 5-Frederick George Axford was born on 29 Jul 1912 in Kew, Victoria. Frederick married Elsie Rogerson on 4 Nov 1967 in Melbourne, Victoria. Elsie was born on 18 Jul 1918 in Tatura, Victoria. They had four children: Barry, Dorothy, Glenda and Laurel. 6-Barry Axford was born on 1 Dec 1941 and died on 28 Jul 1943 at age 1. 6-Dorothy Axford was born on 7 Jul 1948 in Lilydale, Victoria. Dorothy married Geoff Britton on 14 Oct 1967 in Lilydale, Victoria. Geoff was born on 10 Aug 1946 in Lilydale, Victoria. Dorothy next married Tom Dennelzen on 27 Oct 1979 in Mardan, Victoria. Tom was born on 8 Jul 1938 in Zoetermeer, Holland. 6-Glenda Axford was born on 2 Sep 1952 in Lilydale, Victoria. Glenda married George Stoppa on 23 Mar 1974 in Montrose, Victoria. George was born on 1 Sep 1951 in Arieli, Italy. 6-Laurel Axford was born on 14 Oct 1954 in Lilydale, Victoria. Laurel married Terry McAlister in Dandenong, Victoria. 5-Florence Axford was born on 22 Jan 1914 in Kew, Victoria. Florence married Osmond Lambert Barnett, son of Henry Ralph Barnett and Lambert Jane Taylor. Osmond was born on 14 Sep 1982 in Kingston, Tasmania. Florence next married Maurice Clyde Hewitt, son of Clyde Hewitt and Cecile May Lord, on 18 Jun 1957 in Hobart, Tasmania. Maurice was born on 3 Apr 1915 in Edinburgh Hospital, Hobart, Tasmania. They had one daughter: Roberta. 6-Roberta Hewitt was born on 13 Nov 1947 in Hobart, Tasmania. Roberta married Norman Edwin Poynter. 5-Beryl Elizabeth Axford was born on 29 Aug 1916 in Lilydale, Victoria and died on 3 Mar 1969 in Frankston, Victoria at age 52. Beryl married George Edwards on 27 Mar 1943 in Lilydale, Victoria. George was born on 11 Nov 1920 in Ballarat, Victoria. They had four children: Neal George, Ross William, Terrance J. and Glen T.
6-Neal George Edwards was born on 4 Feb 1945 in Moreland, Victoria. Neal married Susan May Golding on 15 Jan 1971 in Cannington, Western Australia. Susan was born on 12 Dec 1947 in Subiaco, WA. They had two children: Brendan Ross and Joanne Lenore. 7-Brendan Ross Edwards was born on 31 Jul 1973 in Dandenong, Victoria. 7-Joanne Lenore Edwards was born on 1 Nov 1975 in Dandenong, Victoria. 6-Ross William Edwards was born in Nov 1946 in Melbourne, Victoria and died in Oct 1947 in Carlton, Melbourne, Victoria. 5-Alma Axford was born on 29 Aug 1916 in Lilydale, Victoria. Alma married Gordon Hutchinson on 16 Mar 1910 in Lilydale, Victoria. Gordon was born on 16 Mar 1910 in Lilydale, Victoria. They had four children: Marjorie, Kathleen, Shirley and Jennifer. 6-Marjorie Hutchinson was born on 9 Dec 1940 in Surrey Hills, Victoria. Marjorie married Barry Hansen on 23 Sep 1961 in Ashburton, Victoria. Barry was born on 12 Jun 1938 in Brighton, Victoria. They had five children: David, Anne-Louise, Anthony, Katrina and Emma. 7-David Hansen was born on 11 Feb 1946 in Sorrento, Victoria. 7-Anne-Louise Hansen was born on 8 Jul 1962 in Sorrento, Victoria. 7-Anthony Hansen was born on 27 Oct 1966 in Sorrento, Victoria. 7-Katrina Hansen was born on 5 Jun 1969 in Sorrento, Victoria. 7-Emma Hansen was born on 4 Jun 1976 in Frankston, Victoria. 6-Kathleen Hutchinson was born on 1 Feb 1942 in Lilydale, Victoria. Kathleen married Eric Melville on 27 Oct 1962 in Ashburton, Victoria. Eric was born on 9 May 1946 in Richmond, Victoria. They had three children: Susan, Mark and Glen. 7-Susan Melville was born on 4 Mar 1964 in Melbourne, Victoria. 7-Mark Melville was born on 11 Nov 1966 in Melbourne, Victoria. 7-Glen Melville was born on 18 Sep 1970 in Melbourne, Victoria. 6-Shirley Hutchinson was born on 14 Apr 1943 in Lilydale, Victoria. Shirley married Valentin Wick on 26 Sep 1964 in Canterbury, Victoria. Valentin was born on 15 Dec 1935 in Indja, Yugoslavia. They had four children: Matthew Robert, Peter Jacob, Jennifer May and Elizabeth Ann. 7-Matthew Robert Wick was born on 16 Feb 1969 in Apollo Bay, Victoria. 7-Peter Jacob Wick was born on 15 Jan 1971 in Melbourne, Victoria. 7-Jennifer May Wick was born on 11 Jan 1973 in Melbourne, Victoria. 7-Elizabeth Ann Wick was born on 11 Jan 1973 in Melbourne, Victoria. 6-Jennifer Hutchinson was born on 8 Dec 1945 in Lilydale, Victoria. Jennifer married Michael Quade on 7 Sep 1968 in Camberwell, Victoria. Michael was born on 13 Oct 1944 in Albert Park, Melbourne. They had four children: Rebecca, Samantha, Anita and Anthony. 7-Rebecca Quade was born on 19 Aug 178 in Warrnambool, Victoria. 7-Samantha Quade was born on 14 Aug 1970 in Warrnambool, Victoria. 7-Anita Quade was born on 1 Aug 1972 in Warrnambool, Victoria. 7-Anthony Quade was born on 5 Jan 1976 in Warrnambool, Victoria. 5-Emily Axford was born on 11 Nov 1918 in Lilydale, Victoria. Emily married William Cross. They had one daughter: Marilyn. 5-Arthur John Axford was born on 15 Dec 1921 in Lilydale, Victoria. Arthur married Lynette Peel on 1 Feb 1947 in Lilydale, Victoria. Lynette was born on 6 Apr 1927 in Ferntree Gully, Victoria. They had four children: Murray, Dianne, Christine and Faye. 6-Murray Axford was born on 18 Jan 1948 in Yarra Junction, Victoria. 6-Dianne Axford was born on 18 Dec 1952 in Yarra Junction, Victoria. Dianne married Gary Weinert on 8 Dec 1973 in Yarra Junction, Victoria. Gary was born on 1 May 1951 in Richmond, Victoria. They had two children: Melanie and Benjamin. 7-Melanie Weinert was born on 29 Sep 1979. 7-Benjamin Weinert was born on 31 Jan 1981. 6-Christine Axford was born on 12 Jun 1955 in Yarra Junction, Victoria. Christine married Michael Nodzio on 19 Oct 1974 in Yarra Junction, Victoria. Michael was born on 18 Oct 1950 in Frankston, Victoria. 6-Faye Axford was born on 9 Mar 1960 in Warburton, Victoria. Faye married Peter De-Haan on 6 Feb 1982 in Yarra Junction, Victoria. Peter was born on 25 Jul 1959 in Rosenberg, Holland. They had one daughter: Jessica. 7-Jessica De-Haan was born on 22 Nov 1984. 5-Robert Axford was born on 10 May 1962 in Lilydale, Victoria. Robert married Edith Henley on 12 Jun 1959 in Paddington, Victoria. Edith was born on 13 Jan 920 in Brisbane, Queensland. They had two children: Robert and Karen. 6-Robert Axford was born on 30 Dec 1960 in Brisbane, Queensland. 6-Karen Axford was born on 29 Nov 1962 in Brisbane, Queensland. 4-Freda Emily Thurrowgood was born on 29 Sep 1890 in Birregurra, Victoria and died on 31 Jan 1940 in Bendigo, Victoria at age 49. 4-Will Harris Thurrowgood-† was born on 21 Jun 1892 in Birregurra, Victoria, died in the First World War on 30 Sep 1917 in Cape Town, South Africa at age 25, and was buried in Woltemade Cemetery (Cemetery 4, Block I, Grave No. 122C), Cape Town, South Africa. He served in the 29th Battalion AIF. 4-Lillias Macbeth Thurrowgood was born on 13 Apr 1894 in Birregurra, Victoria and died on 3 Jul 1970 in Preston, Victoria at age 76. Lillias married William Walter Shell-†, son of Albert James Shell and Martha Ann Groves, in 1914 in Lilydale, Victoria. 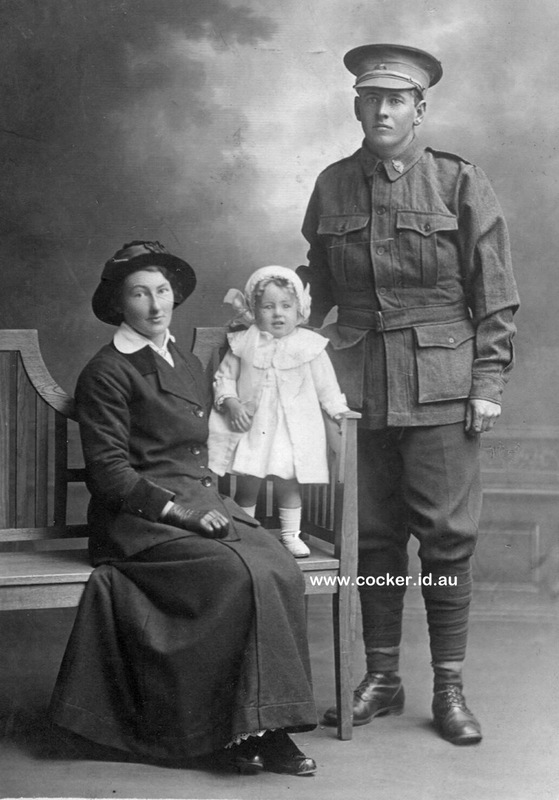 William was born in 1891 in Meredith, Victoria and died in the First World War on 1 Oct 1917 in Ypres, Belgium. They had two children: Lorna Ruth and Ada Robina. 5-Lorna Ruth Shell was born on 5 Jan 1915 in Lilydale, Victoria and died on 17 Jan 1967 in Heidelberg, Victoria at age 52. Lorna married Harold Noel Murphy on 17 Apr 1937 in Thornbury, Victoria. 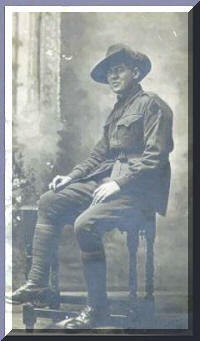 Harold was born on 9 Dec 1911 in Brunswick, Victoria and died on 18 Oct 1951 in Heidelberg, Victoria at age 39. They had three children: Raymond, Valerie Joy and Lorraine. 6-Raymond Murphy died on 7 Mar 1951 in Heidelberg, Victoria. Raymond married Beverly Gration on 7 Mar 1964 in Camberwell, Victoria. They had two children: Darren Raymond and Andrew John. 7-Darren Raymond Murphy was born in Jun 1965 in Croydon, Melbourne, Victoria. 7-Andrew John Murphy was born in Nov 1967 in Croydon, Melbourne, Victoria. 6-Valerie Joy Murphy was born on 6 Aug 1942 in Thornbury, Melbourne, Victoria. Valerie married Albert Henry Crowe. Albert was born on 25 Jun 1932 in Preston, Victoria. They had five children: Jennifer Joy, Stephen Robert, Richard Dean, Sharralyn and Kerrilee. 7-Jennifer Joy Crowe was born on 24 Aug 1962. 7-Stephen Robert Crowe was born on 10 Nov 1966 and died on 8 Sep 1967. 7-Richard Dean Crowe was born on 6 Aug 1970. 7-Sharralyn Crowe was born on 18 Oct 1972. 7-Kerrilee Crowe was born on 22 Jul 1975. 6-Lorraine Murphy was born on 26 Jul 1948 in Preston, Victoria. Lorraine married John Baines on 27 Jan 1979 in Brisbane, Queensland. John was born on 31 Jan 1951 in Caulfield, Victoria. Lorraine next married Bruno Falovic on 15 Jul 1967 in Croydon, Melbourne, Victoria. Bruno was born on 28 Feb 1945 in Germany. 5-Ada Robina Shell was born on 15 Mar 1917 in Lilydale, Victoria. Ada married John Henry Bolger on 17 Dec 1935 in Thornbury Melbourne Australia. John was born on 12 Feb 1914 in Fitzroy, Victoria and died in Jun 1969 in Preston, Victoria at age 55. They had three children: Barry John, Brian Francis and Christopher Leonard. 6-Barry John Bolger was born on 18 May 1946 in Preston, Victoria. Barry married Yvonne Bernadette Kinder on 16 Nov 1965 in Ivanhoe, Victoria. Yvonne was born on 26 May 1947 in Heidelberg, Victoria. They had one daughter: Leanne Margaret. 7-Leanne Margaret Bolger was born on 31 May 1966 in Preston, Victoria. 6-Brian Francis Bolger was born on 8 May 1947 in Preston, Victoria. 6-Christopher Leonard Bolger was born on 27 Sep 1950 in Preston, Victoria. Christopher married Susan Leigh Gray on 17 Feb 1981 in Melbourne, Victoria. Susan was born on 27 Dec 1957 in Frankston, Victoria. They had one son: David. 7-David Bolger was born on 23 Jan 1982 in Carlton, Melbourne, Victoria. 4-Raymond Lewis Thurrowgood was born on 24 Sep 1896 in Birregurra, Victoria and died on 1 May 1897 in Geelong, Victoria. 4-Gwendoline Louise Thurrowgood was born on 5 Apr 1898 in Birregurra, Victoria and died on 4 Nov 1963 in Heidelberg, Victoria at age 65. Gwendoline married Leslie Andrew Wade. Leslie was born in 1899 and died on 9 Jun 1973 in Fawkner, Melbourne, Victoria at age 74. They had five children: Ken, Graham, Russell, John and Peter. 5-Ken Wade. Ken married Betty Telford. 5-Graham Wade was born on 14 Dec 1930 in Bendigo, Victoria. Graham married Elsie Joan Filleul on 12 Jan 1957 in Burnie, Tasmania. Elsie was born on 7 Nov 1930 in Ulverstone, Tasmania. They had three children: Judith Anne, Stephen Graham and Douglas Andrew. 6-Judith Anne Wade was born on 7 May 1958 in Sale, Victoria. Judith married Darren Robert Willcocks. They had three children: Mark Andrew, Graham Robert and Narelle Joanne. 7-Mark Andrew Willcocks was born on 27 Mar 1979. 7-Graham Robert Willcocks was born on 30 Jun 1981. 7-Narelle Joanne Willcocks was born on 30 Jul 1984. 6-Stephen Graham Wade was born on 28 Mar 1960 in Sale, Victoria. 6-Douglas Andrew Wade was born on 13 Sep 1961 in Sale, Victoria. 5-Russell Wade was born on 8 Jul 1932 in Bendigo, Victoria. Russell married Mary Agnes Barrett. Mary was born on 15 Mar 136 in Manangatang, Victoria. Russell next married Irene Norbury on 13 Feb 1954 in Ivanhoe, Victoria. Irene was born on 19 Jan 1931 in Ivanhoe, Victoria. They had four children: Elaine Joy, Leighton Russell, Harvey John and Anita Gaye. 6-Elaine Joy Wade was born on 24 Dec 1958 in Sale, Victoria. 6-Leighton Russell Wade was born on 14 May 1960 in Sale, Victoria. 6-Harvey John Wade was born on 15 Jun 1964. 6-Anita Gaye Wade was born on 3 Mar 1969. 5-John Wade was born on 28 Nov 1937 in Thornbury, Melbourne, Victoria. 5-Peter Wade was born on 11 Sep 1940 in East Brunswick, Melbourne, Victoria. Peter married Glenda Heads on 26 Dec 1964 in Preston, Melbourne, Victoria. Glenda was born on 22 Nov 1943 in Essendon, Victoria. They had three children: Cameron Peter, Nicole Jane and Robin Macbeth. 6-Cameron Peter Wade was born on 6 Jun 1968. 6-Nicole Jane Wade was born on 23 Feb 1970. 6-Robin Macbeth Wade was born on 24 Jan 1973. 4-Dulsie Miriam Thurrowgood was born on 12 Jun 1900 in Lilydale, Victoria and died on 15 Dec 1981 in Kew, Victoria at age 81. Dulsie married William J. Hamilton on 2 Jan 1937 in Bendigo, Victoria. 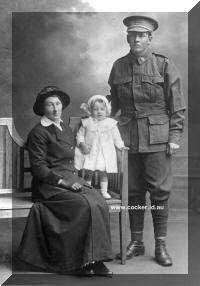 William was born on 31 May 1894 in Queensland and died on 21 Dec 1973 in Blackburn, Victoria at age 79. 4-George Harold Thurrowgood was born on 2 Jul 1902 in Lilydale, Victoria and died on 28 Jan 1976 in Mitcham, Victoria at age 73. George married Stella Victoria Dunstan on 31 Jan 1931 in Bendigo, Victoria. Stella was born in 1900 in Gredgwin, Victoria. They had three children: Margaret, Harold William and Lynette. 5-Margaret Thurrowgood was born on 6 Jun 1932 in Bendigo, Victoria. Margaret married Geoff Branton Portbury on 18 May 1957 in Box Hill, Victoria. Geoff was born on 20 Oct 1931 in Box Hill, Victoria. They had two children: Gary Mark and Jennifer Margaret. 6-Gary Mark Portbury was born on 2 Jun 1959 in Box Hill, Victoria. Gary married Maxine Evelyn Honey on 3 Nov 1984 in Cobargo, New South Wales. Maxine was born on 26 Jul 1963 in Carlton, Melbourne, Victoria. 6-Jennifer Margaret Portbury was born on 11 Feb 1961 in Blackburn, Victoria. Jennifer married Ian James Young on 29 Jan 1983 in Box Hill, Victoria. Ian was born on 28 Jul 1957. 5-Harold William Thurrowgood was born on 15 Oct 1936 in Bendigo, Victoria. Harold married Patricia Norma Clarke on 5 Apr 1958 in Box Hill, Victoria. Patricia was born on 20 Oct 1935 in Box Hill, Victoria. They had two children: Susan and Peter. 6-Susan Thurrowgood was born on 25 Mar 1960 in Box Hill, Victoria. Susan married Owen Hughes on 14 Aug 1982 in Balwyn, Victoria. 6-Peter Thurrowgood was born on 30 Nov 1962 in Box Hill, Victoria. Peter married Irene Tepe on 31 May 1968 in Blackburn North, Victoria. 5-Lynette Thurrowgood was born on 19 Oct 1937 in Bendigo, Victoria. Lynette married Alan Davis on 11 Aug 1956 in Box Hill, Victoria. Alan was born on 11 Nov 1935 in Yarram, Victoria. They had three children: Karen, Debbie and Brett. 6-Karen Davis was born on 16 Jul 1957 in Rochester, Victoria. Karen married Peter Kendall on 6 May 1978 in Gardiner, Victoria. They had one daughter: Nicole. 7-Nicole Kendall was born on 14 Apr 1981 in Box Hill, Victoria. 6-Debbie Davis was born on 5 Apr 1960 in Box Hill, Victoria. Debbie married John Bell on 23 Mar 1985 in Doncaster, Victoria. John was born on 16 Feb 1959 in Box Hill, Victoria. 6-Brett Davis was born on 11 Mar 1963 in Box Hill, Victoria. 4-George Harold Thurrowgood was born on 2 Jul 1902 in Lilydale, Victoria and died on 28 Jan 1976 in Mitcham, Victoria at age 73. William next married Mary Selina Chandler, daughter of Thomas Chandler and Mary Bayley, in 1864. Mary was born about 1824, died in 1880 in Victoria aged about 56, and was buried in Geelong Western Cemetery. . She was the sister of Jacob Chandler who married two of Mary’s sisters, Hannah and then Martha and was witness at William and Eliza’s wedding. Jacob founded the famous Chandlers shipyards at Battery Point. They had two children: Mary Ruth and Ebenezer Cyrus. 3-Mary Ruth Harris was born in 1865 in Newtown, Geelong, Victoria and died about 1921 aged about 56. Mary married William Thomas McCure, son of George McCure and Mary Anne Reeves, in 1891 in Victoria. William was born in 1867 in Geelong, Victoria and died in 1901 in Geelong, Victoria at age 34. 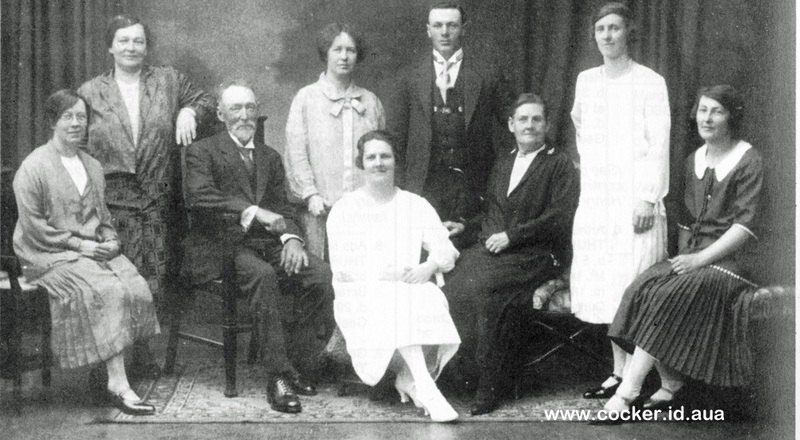 They had four children: William George, Percy Cyrus, Edith Hilda and Sydney Louis. 4-William George McCure was born in 1892 in Geelong, Victoria and died in 1970 in Moonee Ponds, Victoria at age 78. 4-Percy Cyrus McCure was born in 1894 in Geelong, Victoria and died in 1971 at age 77. Percy married Esther Magdalen Reichenbach in 1921 in Victoria. They had one daughter: Ruth. 5-Ruth McCure was born about 1925 in Jeparit, Victoria and died in 1932 in Fairfield, Victoria aged about 7. 4-Edith Hilda McCure was born in 1896 in Geelong, Victoria and died in 1928 in Jeparit, Victoria at age 32. Edith married Herbert Ernest Reichenbach, son of Carl Ludwig Reichenbach and Alma Johan Deutscher, in 1925 in Victoria. Herbert died in 1976. 4-Sydney Louis McCure was born in 1901 in Geelong, Victoria and died in 1981 at age 80. Sydney married Grace Florence Sabin in 1928 in Victoria. Grace died in 1979. They had one son: Les. 5-Les McCure. Les had a son: Troy. 3-Ebenezer Cyrus Harris was born in 1866 in Geelong, Victoria, died on 26 Nov 1870 in Geelong, Victoria at age 4, and was buried on 29 Nov 1870 in Geelong Western Cemetery. William next married Ann Elizabeth McCure, daughter of John Bunyan McCure and Frances Anne Elizabeth Richardson, in 1881 in Geelong, Victoria. Ann was born in 1832 in East Dulworth, Surrey, England and died in May 1889 in Geelong, Victoria at age 57. They had no children. William next married Hannah Woollard in 1890 in Victoria. Hannah was born about 1842 in England, died on 15 Oct 1907 in Caulfield, Victoria aged about 65, and was buried on 17 Oct 1907 in Geelong Eastern Cemetery. They had no children. 2-Charles Harris was born on 8 Jul 1823 in Saint Paul, Deptford, Kent, England, was christened on 3 Aug 1823 in Saint Paul, Deptford, Kent, England, and died on 22 Oct 1889 in Westbury, Tasmania at age 66. Charles was baptised as Benjamin Harris. Charles married Isabella Murray, daughter of David Murray and Marion Carmichael, on 19 Jan 1853 in Home of Mrs Murray, Longford, Tasmania. Isabella was born on 8 Jun 1829 in Macquarie River, Campbell Town, Tasmania, was christened on 16 Dec 1830 in Kirklands Presbyterian Church, Campbell Town, and died on 8 Aug 1900 in Home of daughter Emily, 48 Elizabeth St. Launceston, Tasmania at age 71. They had nine children: Charles Francis, Leonard Montague, Rosalie Dove, Emily Grace, Annie Addella, Alfred, Mary, Margaret Bertha and Thomas Carmichael. 2-Louisa Harris was christened on 18 Jan 1825 in Saint Paul, Deptford, Kent, England and was buried on 26 Jan 1825 in Saint Paul, Deptford, Kent, England. England & Wales deaths 1837-2007 Volume 4A, Page 89.